Public is invited to Hogan’s Beach to test ride a Sea-Doo personal watercraft. What: BRP Sea-Doo is offering consumers the opportunity to test ride new 2013 Sea-Doo watercraft, equipped with iBR, the world’s only on-water brake system at Test Ride events across the United States this spring and summer. The 2013 Sea-Doo Test Ride Tour will be visiting 23 popular family boating destinations and the next stop is in Tampa at Hogan’s Beach on Courtney Campbell Parkway. The Sea-Doo Test Ride events will be FREE to the boating public* Each Sea-Doo Tour STOP is designed for both experienced and first time boating families to experience the Sea-Doo lifestyle in a casual, fun filled atmosphere. Consumers are encouraged to visit http://www.seadoodemo.com to pre-register for the event and request a custom time block on the day of their choice. When: The Sea-Doo “I Brake For…” Test Ride Tour will be in Tampa, Friday April 12, 1-5 p.m., and Saturday and Sunday, April 13-14, from 10:00 a.m. to 5:00 p.m. 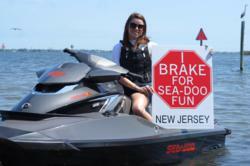 Details: Visit http://www.seadoodemo.com or http://www.facebook.com/seadoo for the most up-to-date information regarding the Sea-Doo “I Brake For…” Test Ride Tour events and everything Sea-Doo! *All Sea-Doo Test Ride Tour participants must posses a valid drivers license and must be over the age of 18 and in some states/provinces may be required to posses a safe boaters certificate/card/license.